Cut the largest possible rectangle from a circular quadrant, as shown in Fig. 40. As shown in Fig. P-269, there is a gap between the aluminum bar and the rigid slab that is supported by two copper bars. At 10°C, Δ = 0.18 mm. Neglecting the mass of the slab, calculate the stress in each rod when the temperature in the assembly is increased to 95°C. For each copper bar, A = 500 mm2, E = 120 GPa, and α = 16.8 µm/(m·°C). 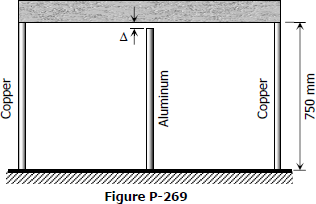 For the aluminum bar, A = 400 mm2, E = 70 GPa, and α = 23.1 µm/(m·°C). In Problem 236, how should the lengths of the two identical copper rods be changed so that each material will be stressed to its allowable limit? A rigid block of mass M is supported by three symmetrically spaced rods as shown in Fig. P-236. Each copper rod has an area of 900 mm2; E = 120 GPa; and the allowable stress is 70 MPa. 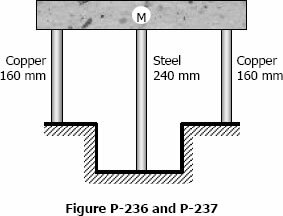 The steel rod has an area of 1200 mm2; E = 200 GPa; and the allowable stress is 140 MPa. Determine the largest mass M which can be supported.